Pattaya, Thailand – The Pattaya Exhibition And Convention Hall (PEACH) was recently awarded the prestigious Thailand MICE Venue Standard Certificate issued by the Thailand Convention and Exhibition Bureau (TCEB). Situated in an unbeatable location with cutting-edge meeting facilities, this recognition certifies the venue’s position as a leading MICE destination in Asia. Ms. Thanida Sriju, a sales manager of the Royal Cliff Hotels Group, received the Thailand MICE Venue Standard Certificate for Pattaya Exhibition And Convention Hall from Mr. Weerasak Kowsurat, the Minister of Thailand’s Tourism and Sports in Bangkok. TCEB initiated the Thailand MICE Venue Standard (TMVS) in 2013 to develop Thailand’s meetings and exhibition venues. Due to its nationwide success, it is used as a framework adopted by other ASEAN nations in developing a common standard across the region. 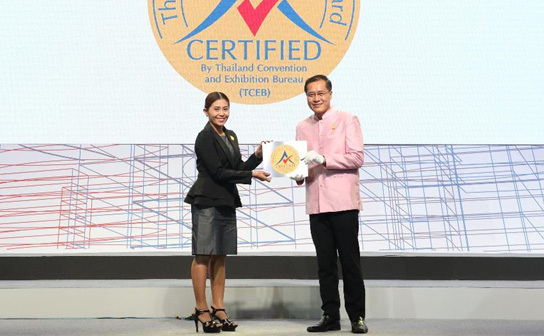 This year, a total of 107 MICE venues and 332 meeting rooms across the country have been certified under the Thailand MICE Venue Standard 2018. The certificate recognizes PEACH’s outstanding meeting facilities that meet internationally recognized standards making it a leading MICE venue not just in Pattaya but in Thailand as a whole. A world-renowned award-winning convention facility under the flagship of the Royal Cliff Hotels Group, PEACH has been the chosen venue for numerous prestigious meetings and events. Offering an ideal location, modern facility and professional service, it is the perfect venue to hold any kind of event and can accommodate up to 10,062 people theatre-style. Let us make your events extraordinary! Want to hold your next event at PEACH? Request for a proposal by contacting our Sales Managers at (+66) 38 250 421 Ext: 2845 or email: success@royalcliff.com.